Oz Comic-Con are very pleased to announce Benedict Cumberbatch is set to join the fun at Oz Comic-Con Adelaide and appear at two exclusive Oz Comic-Con Q&A events in Sydney. WHAT?! SHERLOCK IS COMING TO MY HOME TOWN??? There were 33 sleeps from the time I bought tickets to the day I, and my friend Asha, were due to see this very talented actor, and they felt like the longest 33 days ever. I found myself re-watching all three series of BBC’s Sherlock and going back through my “Cumber-collection” of his many other works that range from playing Hugh Laurie’s eldest son in the 2003 comedy series Fortysomething, to his short films (make sure you check out Inseparable) and even his various radio serials for BBC Radio (Cabin Pressure, Rumpole and Neverwhere) and audiobooks (your life will never be the same again after you hear Cumberbatch as Casanova). 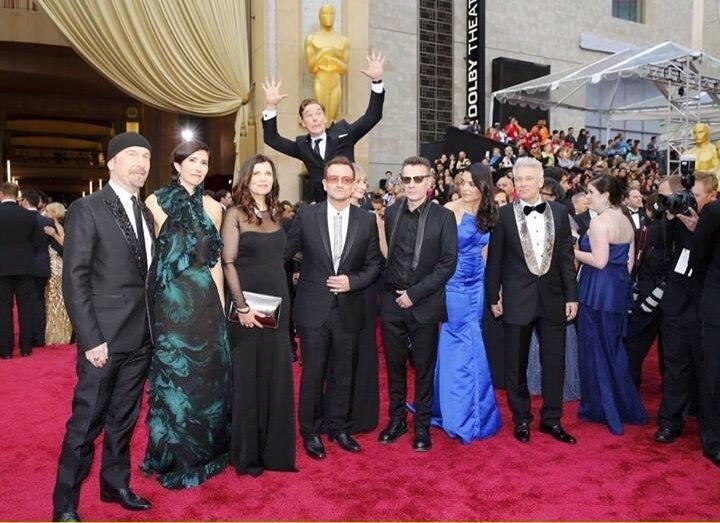 While you may have never heard of Benedict Cumberbatch until you saw him photobomb U2 at the Oscars or heard Ellen DeGeneres introduce him as “the man with the best name ever”, once you look at his long list of filmography, you will realise you have probably seen him in a million things before without realising who he was. Ever since the announcement a little while ago that he was set to return to the London stage in autumn of 2015 to play the title role in Hamlet, I bet there’s been a renewed interest in reading the Bard again. Heck, he’s the only reason I paid to see Star Trek: Into Darkness (nothing against Trekkies, I’ve just never been one of them). So, back to Benedict’s big visit to Sydney – yes, I feel like now that I have met the man in person, we can be on a first name basis. A few days earlier, I had joined the “Benedict Cumberbatch in Australia” fan group on Facebook where many other fans who had attended his panel at the Adelaide event the previous weekend posted stories of their experiences and shared tips for the day. Top of the list seemed to be “DON’T FORGET TO BREATHE”. Other information included guidelines on how to behave and boundaries as to what he will and will not agree to do in photographs and what he will and will not sign if presented to him for autographs. Those were very handy to know even if they seemed like commonsense to me. We attended the Saturday session and the day started pretty early for me, but seeing as how I had woken up several times during the night from anxiety anyway, it was no big deal. By the time I picked up my friend Asha from her hotel and arrived at the University of NSW campus (my old alma mater from waaaaaaay too long ago! ), there were already probably a couple of hundred people queuing up at the door waiting to be checked in. The first piece of good news they announced just prior to opening the doors was that everyone would be able to buy a “token” for a photograph with and an autograph from Ben (previously they advised that it was first come, first served based on your seat location and only available for a limited number). Once we were checked in with our coloured wrist bands we were ushered into different lecture theatres where we were shown a range of video clips featuring past interviews with Benedict and various fan videos (widely available on YouTube) to keep us entertained until Benedict arrived for the photo opps. Each row was called and everyone excitedly went down to the photo area for their brief moment with Ben. Several thoughts occupied my mind as I waited for my turn: “Please don’t let me trip or slip”, “Try not to look goofy”, “Remember to smile and say hello”, “Stand up straight”, “OHMYGODOHMYGOD IT’S REALLY HIM!! !” and of course, “Don’t forget to breathe”. I am very happy to report that I did not trip or slip, although some friends have suggested that he would have caught me in his arms and been a real gentleman to help me straighten up but I really didn’t want that to be his only impression of me! When it was my turn, he looked me straight in the eye, gave me a broad smile and said hello, then checked out my shirt before we got into our pose. At this point, my brain was filled with the following thoughts: “OHEMGEE HE HAS HIS ARM AROUND ME” and “MY HAND IS ON HIS WAIST” (several people have mentioned how soft his shirt is and I can attest to that fact!). Unfortunately, all other intelligent thoughts escaped me as we stared into the camera and *click* and I was done! “Oh no! I have to let go of him now! Do I have to? But I don’t want to! I want to give him a big hug!” Alas, just as Sherlock failed to express his thoughts out loud to John Watson at being asked to be his best man, these thoughts also remained only inside my mind. For the next many minutes after my brief encounter, my hands were shaking. Although I have interviewed celebrities I admired before, those were only phone conversations. Being in the presence of a celebrity you admire is a whole different kettle of fish. I was just as star-struck at that moment as the day I met Alec Baldwin at the stage door on Broadway last year after his performance in Orphans. Does anyone ever get used to this? We had a couple of hours to kill before the autograph session , which meant that Ben remained holed up inside smiling and posing for all his fans. It was probably just as well he remained indoors given Sydney had been making him feel at home with London weather: cool temps, wind and lots of rain interrupted by the occasional ray of sunshine. Once we had calmed down a little from our excitement, Asha and I had some lunch while we stared at our photos with Ben. We met another lady who sat near us who showed us photos of her past encounters in the UK with other celebrities like “Ten” and “Eleven” (aka David Tennant and Matt Smith from Doctor Who in case you have been living under a giant rock). Wow! After eating lunch, we noticed people had started disappearing back inside the theatre so we headed back in to find that it was our turn to line up for autographs. 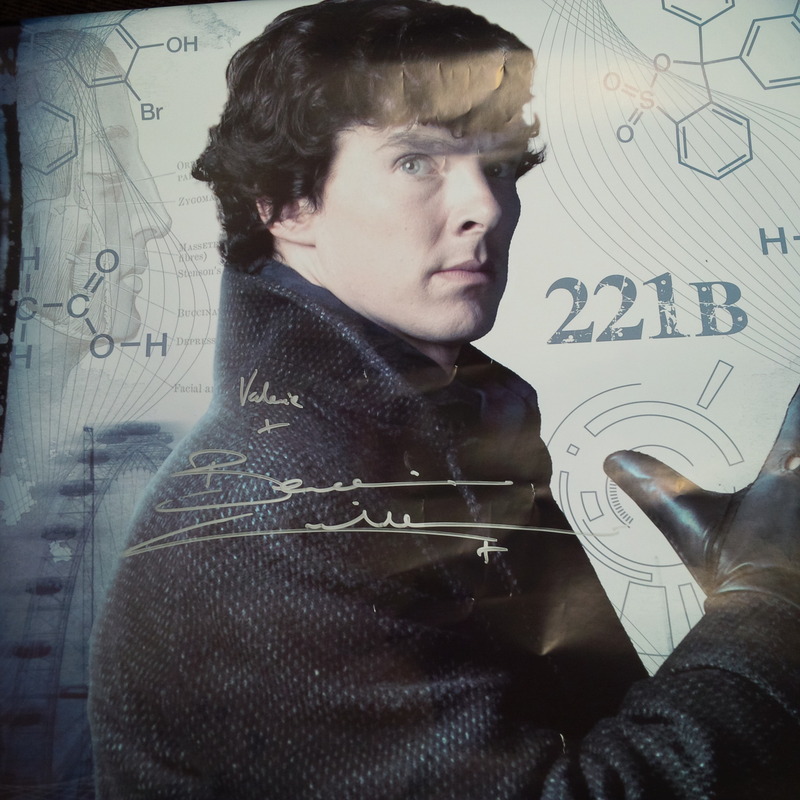 I had brought along my giant Sherlock poster for Ben to sign (maybe one day I can get the John Watson one signed by Martin Freeman to make it a matched set…one can dream, right?). Strangely enough, I felt a little calmer as I stood in line this time compared to my initial encounter. A staff member came down the line to write our names on a Post-It note so that Ben could copy the spelling instead of risking us all turning mute and forgetting our own names. When it was my turn, I unrolled my poster for him. He looked up at me from his seat, said “Hi Valerie” and started to write my name on the poster. At that point, I made a special request for him to feel free to sign his name as big as he’d like since it was a big poster. He laughed and said “I’m going to miss a few letters in my name if I make it any bigger”…or something along those lines – my brain was still not functioning as clearly as I had hoped. After that, we found a spot to sit and catch our breaths. I honestly don’t know how Benedict wasn’t suffering from Carpal Tunnel by the end of the day. At around 4pm, we were all being ushered to the John Clancy Auditorium where the Q&A session was to be held. We were in Row F which turned out to be an excellent vantage point as we were in the aisle with no-one in front of us. Awesome! It took almost half an hour to get every person into their seat. We were asked to raise our hands if we had a question for Benedict and a staff member named Evan roved the auditorium with a microphone. Unfortunately I did not get to ask my question – maybe one day. Benedict was greeted with tremendous applause when he walked out on stage, with a huge smile on his face, looking relaxed and happy. As he mentioned several times during the hour-long panel, this was his favourite part of these events – the opportunity to talk to his fans, even if it’s not as intimate a setting as posing for photographs one-on-one. He was clearly in no hurry to go anywhere as he made jokes and settled in for an afternoon being quizzed by his biggest fans. The thing about fame and celebrity – is still a surreal feeling for him. Obviously he needs to have fans to be in the audience or he would have no work but having this level of interest in him and his private life still feels surreal and not something he is used to yet but when fans approach him, shy and giggling, that makes him giggle too (so glad we amuse him as much as he amuses us!). Roles he would like to play and directors he would like to work with – audience began shouting out suggestions: Bond! Doctor Who! Star Wars! Scorcese! Tarantino! Spike Jonze (Benedict loved the movie, Her)! Joss Whedon! “Please don’t tweet that” – Benedict is well aware of journalists taking things he says out of context, especially when some just cut and paste from other interviews, it makes him mad. At one point during the panel, Benedict asked for some water, to which the audience responded with “aaaawwww”, which made him laugh and said “oh he’s thirsty! He’s just like us!” which got another round of cheers. Adding to his point that his celebrity makes us all act a little crazy, he said “I could literally tell you to f**k off and you would all go ‘aaaaaww, he told me to f**k off'” which got an even bigger round of applause and made him laugh. When the MC announced there would be no more questions, Benedict said “I know you say last question but these people have nowhere else to go, do they?” (Nooooo!) “So let’s keep going!” Clearly this man was at his best just being himself and chatting with fans. If only we could have spent another hour with him. There were other questions but I’m afraid I don’t remember them all. If you have any to add, please post them to the comments below. Well, that’s about all I have to report. 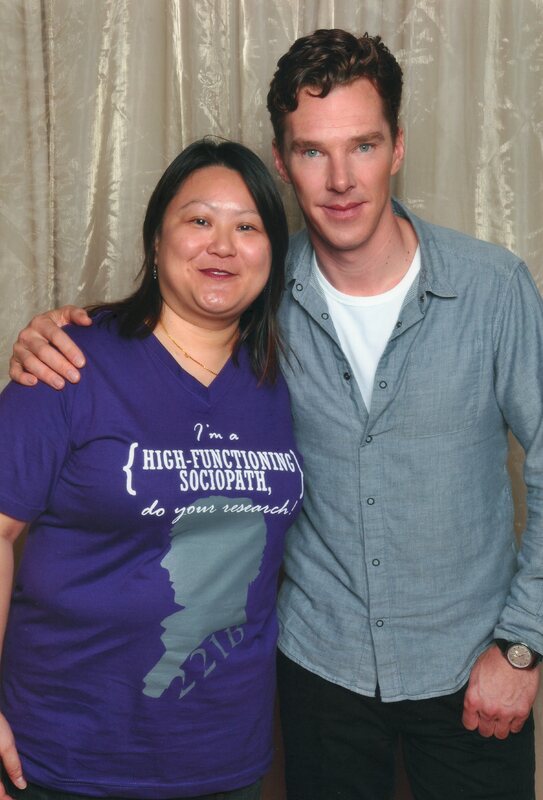 I still smile every time I look at my picture with Mr Cumberbatch. I had a Cumberiffic time meeting other Cumberfans, cheering and talking about his Cumbersocks. It is a day I will not soon forget, and I will always have this blog post to remind me of the fun and excitement of the day. Now, next on my bucket list would be to see him perform on stage in 2015! Thanks to all the staff and organisers who helped rein in all of us crazy fangirls and fanboys over the weekend and for making sure everyone, including Benedict, had a good time and brings home fond memories of his visit to Sydney and Adelaide. Until next time! This entry was posted in Humour and tagged BBC Radio, Bendedict Cumberbatch, Benedict Cumberbatch in Australia, Cabin Pressure, Casanova, Cumberbatch, Fandom, Fortysomething, Frankenstein, Hamlet, Inseparable, Neverwhere, Oz Comic-Con, Parade's End, Rumpole, Sherlock, Smaug, star trek, Sydney, The Hobbit on April 14, 2014 by Valerie Leung. Go away Jon! I am going to send Daryl Dixon after you with a comment like that! I had 100 things I wanted to say to him. How did he manage to maintain such pleasant bearing when he’s signing autographs and smiling for hours and hours on end? And this is the man who says he’s not very patient! What? I hope he never loses this love and sense of humour about his celebrity. I’m going to post the link to your blogpost there! Thanks again! A wonderfully fun read…you are “just like us” in being a fan. Seriously, you hit on all the points any of us would want to know! Thank you. I love everything about this post. The event sounds amazing! Also, I have to tell you how much I love all your Benedict Cumberbatch fangirling on Facebook and Twitter. I know it’s just a sign of withdrawal, and I’m sorry. But I’m seriously enjoying it =DD. It was my first experience of meeting a celebrity at an organised event. I can’t imagine what going to one of the cons like you have been to would be like! If I was his anxious meeting just one of my favourite celebs, I think I would need a pacemaker to go to SDCC! Haha. Glad you are enjoying the BC fangirling. That FB group has been very nice and respectful of the fandom which is wonderful because, as you are well aware, it doesn’t always happen.